It hasn't quite hit me yet that the college basketball careers of Brandon Davies, Brock Zylstra, and Craig Cusick are soon coming to an end. I assume they will go to the NIT tournament and still have a few more home games after the official last home game against Gonzaga tomorrow . . . but it will still be tough to see them leave the Marriott Center for the last time. Here's my inadequate tribute to three of the best ballers in Provo. If I haven't made it clear already, I absolutely love Brandon. I think he is one of the hardest working, most genuine, most enthusiastic, and most admirable athletes BYU has ever had. I am still totally in awe about his comeback last year and how he handled all the criticism he went through. After his honor code suspension, he could have easily transferred to another school, or given up and gone to live in a cave (that's probably what I would have done!) But he didn't, and that speaks miles about his character. Because he decided to stay, Brandon will likely leave BYU in the top-ten all time in points scored, rebounds, and a few other categories. He will also leave a legacy behind that leaves a great impression on and image of BYU, the LDS Church, and Brandon himself. I think Brandon is going to be the hardest player to replace next year, by far. I'm not sure what his odds are of having a professional basketball career (it's probably more likely in Europe than here in the U.S.), but whatever he does, I hope he's happy and is able to continue to play the sport he loves. I'm always down for a one-on-one game if you're bored, B. Just go easy on me. haha. I can't think of Brock without thinking of the Iona game in the NCAA tourney last year. 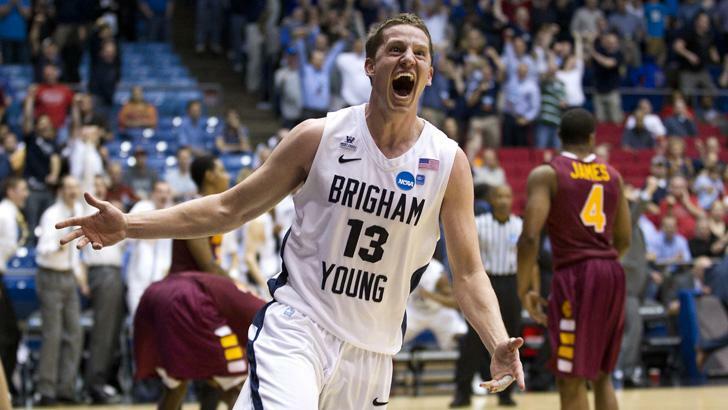 The picture of him screaming for joy after hitting a 3-pointer that sealed the deal and won the game for the Cougars is permanently ingrained in my mind. A copy of it is even hanging on the wall above my desk, which is almost solely dedicated to BYU sports posters and pictures. I can't look at that picture without smiling. I also remember him particularly for his perfect game against San Francisco last year, hitting 8-for-8 from the field, including 6 treys. Brock has had a lot of ups and downs in terms of consistency and playing time throughout his four years at BYU, but overall, he has been a solid contributor. He's got a great attitude and always plays hard. Especially since the news broke last week about Craig's father being diagnosed with cancer, I've really felt for him. I lost my Dad to cancer, so I know all too well what he's going through. But unlike Craig, I wasn't in the spotlight. I can't even imagine how hard it would be to go play a basketball game in front of thousands of people just hours after finding out about the diagnosis. On the day my dad was diagnosed, I couldn't stop crying . . . I never would have been able to leave the house, let alone have enough composure to make the winning shot with 0.2 seconds left on the clock against an in-state rival. When I watched the video back and realized Craig was like halfway across the court when the ball left Matt's hands, yet he still had the presence of mind to race toward the free throw line and correctly predict exactly where that ball would land off the miss, I'm totally blown away. I've always liked Craig, even well before the Utah State game, and I've always felt badly for him not having a scholarship. I'm not sure I would have stuck with it until the end if I were him, but he's shown a lot of character and a pure love of the game to keep on playing, even without any monetary compensation. I would also like to thank him again for helping me feel like a little less of an old maid (even though he's married and younger than me . . . haha.) when I talked to him at the Cougar Tipoff in October. You're a good guy, Craig, and Cougar Nation will miss you. Thank you for seeing the light and leaving the dark side (a.k.a. the University of Utah) and coming to BYU for the last 2 years. :) My prayers are definitely with you and your family.